If you are a fan of menswear, you are likely aware of a designer by the name of Michael Bastian. He’s definitely amongst the higher end designers, but he has been known, on occasion, to dip into the lower end, mid-range markets as well. This can be seen by his collection of polos that he did for Uniqlo a few years back (and actually for a few years in a row, as well). Recently, though, his brand has released a small, but still substantial, mid-range line of products, many of which are available for purchase through Amazon. While a typical Michael Bastian dress shirt from his classic line would cost upwards of $100, a dress shirt from this new, Amazon, mid-range line costs about half that. And there is a lot more available from Michael Bastian on Amazon at these sorts of prices. For this review, we took a look at the Michael Bastian Slim Fit Spread Collar Dress Shirt ($49.25). There are well over a dozen different fabric patterns to choose from, and they all look super nice. It’s what you would expect from a real designer line of clothing. 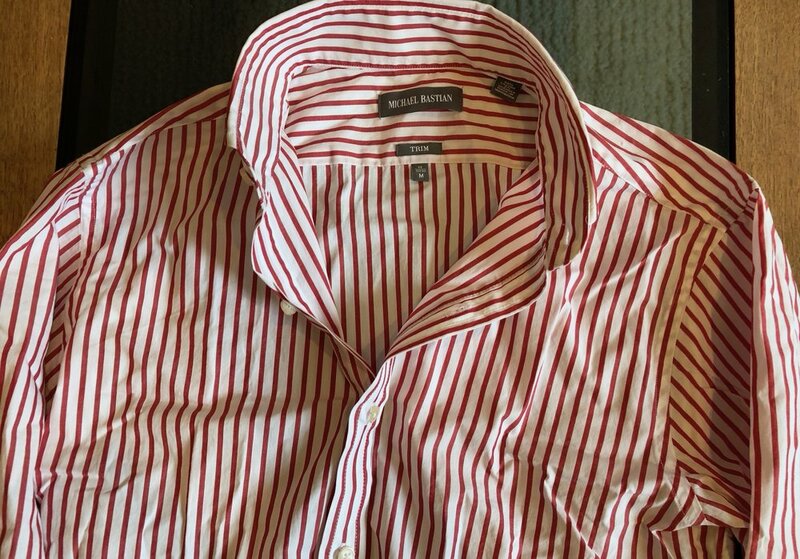 Yes, there are the more basic, plain, gingham shirts, but there are also much more unique patterns, like the red and white bengal stripe option we tried for this review — not to mention many other super cool patterns that you’ll likely enjoy a lot. It’s a great line of shirts. Chest 21.00" 20.50" 19.00" 20.75"
Wrist 9.50" 10.00" 10.00" 9.33"
Bottom 20.00" 18.50" 20.00" 20.00"
Length 30.25" 30.75" 27.50" 28.75"
Neck 15.00" 15.50" 15.50" 15.50"
Sleeves 24.25" 25.00" 25.00" 25.00"